Just a few years ago, diagnosis of Marfan syndrome and related disorders was achieved exclusively through a multi-system clinical assessment, along with a detailed family medical history. In recent years, however, genetic testing for mutations in the fibrillin-1 (FBN1) and other related genes -- which are known to be responsible for these conditions -- has improved a great deal and has become more affordable. In 2013, these advances prompted The Marfan Foundation's Professional Advisory Board (PAB) to revise its statement on the role of genetic testing in the diagnosis of Marfan syndrome and related disorders. In this statement, the PAB identifies many reasons the testing can be beneficial. Still, the science behind genetic testing for Marfan syndrome and related disorders is complex and not everything is known yet. It is also not without cost, and in cases where clinical evaluation alone can provide a firm diagnosis (such as presentation of lens dislocation and a rapid aortic enlargement or dissection), additional genetic testing does not (yet) change anything about recommended course of treatment. It's therefore important to understand what testing currently can and cannot tell you and, most of all, to consult a genetic counselor or a medical geneticist familiar with Marfan syndrome and the related connective tissue disorders if you decide it's something you'd like to pursue. If you have a suspected diagnosis and no one else in your family has been diagnosed, testing can tell you whether or not you have a mutation in the FBN1 gene and whether or not that mutation is commonly associated with Marfan syndrome. Confirmation of this genetic mutation in combination with presentation of some of the clinical features would generally be considered enough to confirm a diagnosis. Testing can tell you whether or not you have a mutation in a different but related gene, such as TGFBR1 or TGFBR2, the mutations that are associated with the related disorder Loeys-Dietz syndrome. Because the risks of Loeys-Dietz syndrome are different than those of Marfan syndrome, this differential diagnosis is crucial for identifying the correct monitoring and treatment protocol. (Similar considerations apply for other types of aortic disease). Genetic testing cannot tell you the course or severity or even which Marfan features you will develop, even if you can confirm the same genetic mutation as a family member. Lack of any genetic mutation in the FBN1 gene also cannot definitively tell you that you do not have Marfan syndrome because current best estimates suggest that no mutation is found in about 5-10 percent of people with clear-cut Marfan syndrome. This is only a sample of what genetic testing can and cannot tell you. 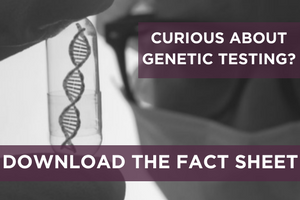 For more details, including recommendations for adults with Marfan syndrome who are considering having children or who have recently gotten pregnant or had a child, see the downloadable fact sheet on Genetic Testing and Marfan Syndrome. If a parent, child, or sibling has a confirmed case of Marfan syndrome or a related disorder but you do not (yet) have any signs, genetic testing can provide a definitive diagnosis or rule out the possibility of the condition. The family member with a confirmed case would first have to undergo genetic testing to identify the exact mutation present. At that point, you and any other parents, siblings, or children can undergo a much less expensive version of genetic testing called linkage analysis (which costs, on average, $250). The presence of a matching mutation would definitively confirm you have the same disorder and the absence of the mutation would confirm you do not. This is powerful information for you and your family to have. Family members with the same mutation can be screened and followed for aortic disease to prevent aortic dissections. Family members without the mutation do not need to be screened for aortic disease. Remember, if you decide to pursue testing, find a genetic counselor or medical geneticist familiar with Marfan syndrome and the related disorders, and consult with your regular physician as well, about what genetic testing can and cannot clarify for you. You can find geneticists experienced with Marfan and related disorders in the Foundation's clinic directory. You can also contact Jan Lynch, MSN, RN, the director of our Help & Resource Center at jlynch@marfan.org. The Marfan Foundation creates a brighter future for everyone living with Marfan syndrome and related disorders.